What's The Worst Bridge In America? 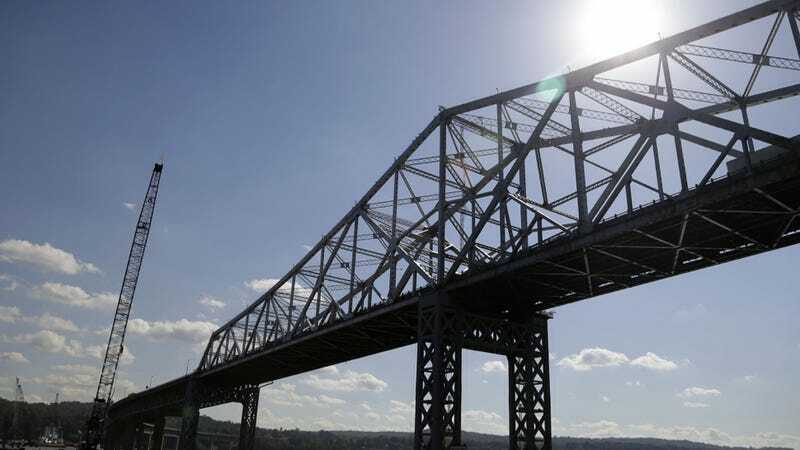 The Tappan Zee Bridge is, and always has been, a bit of a disaster. Built in the wrong spot, way too old, and perched precariously along a major East Coast transportation artery, it was referred to by a governor's aide as the "hold-your-breath bridge." That's how terrible some bridges are in the United States. The Tappan Zee, spanning the Hudson River at its widest point just north of New York City because of a tax revenue dispute between state and city authorities, brings thousands of commuters to and from their jobs every day. As long as they travel by car, that is, as there are no mass transit options. Not that you'd want to really travel across it at all unless absolutely necessary, as it was designed to last only 50 years, when it was built 59 years ago. It's hideous design is also "fracture critical," meaning that there aren't many redundancies built in if something goes wrong. And nothing possibly could go wrong, right? I mean it's not like it's a major target for terrorism, it straddles a busy maritime lane, and it sits atop an active fault line. A replacement bridge is on its way, but it won't be finished until 2018 at the earliest. So enjoy it for a few more years. Oh, and that new bridge doesn't have any real mass transit options, either. But maybe the Tappan Zee isn't the absolute worst bridge in America. America's infrastructure, the arteries that carry the blood of this nation, is crumbling. And Congress refuses to do anything about it. Think you've got a bigger disaster waiting to happen on your hands? Drop it in the comments below.